Although it has limited use as a culinary ingredient, Oregon grape is packed full of medicinal potential. Learn all about Oregon grape's medicinal potential, history, and characteristics. Oregon grape hails from North America and has particular importance in its namesake state, Oregon. It typically grows in the Rocky Mountains and can survive as high as 7,000 feet (2,000 meters), but can also be found in areas ranging from Colorado to the Pacific Coast. The history of Oregon grape stretches back centuries to use by Native Americans, and today the Oregon grape is recognized for its valuable medicinal uses. Treating skin conditions. Several painful and itchy skin conditions, such as eczema, psoriasis, and acne, can be ameliorated with Oregon grape. Relieving digestive ailments. Oregon grape has been shown to improve stomach problems, including diarrhea and possibly irritable bowel syndrome (IBS). Healing bacterial and fungal infections. Oregon grape has antimicrobial properties that give it the ability to kill several different bacteria and fungi. The most potent compound in Oregon grape is an isoquiline alkaloid called berberine, which is responsible for the majority of its health benefits. Berberine demonstrates significant antibiotic and antifungal properties, which helps to heal infection as well as heal skin conditions. It has also been shown to have a beneficial effect for those suffering for diarrhea, although the exact mechanism of this action is unknown. 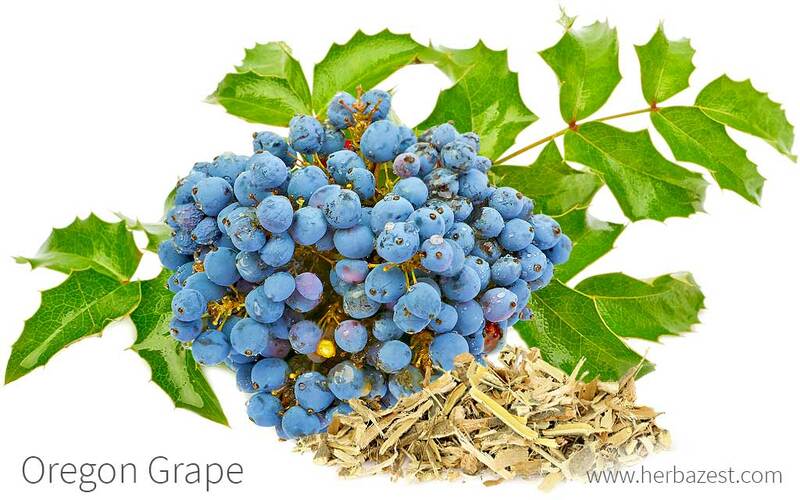 Oregon grape also contains tannins and alkaloids, which are known for their anti-inflammatory properties. These compounds help to reduce pain and irritation associated with skin ailments, and they can also reduce inflammation in the intestinal tract to improve digestion. Herbs that also provide antimicrobial properties are honeysuckle, onion, and thyme. Oregon grape is thought to be safe in recommended amounts, although little research exists about the internal use of the herb. Taking Oregon grape internally for more than two to three weeks is not recommended. Topical use of Oregon grape appears safe, but may cause itching, burning, irritation, and allergic reaction. Oregon grape may interact with medications such as tetracycline, doxycycline, or cyclosporine. It may also interact with medications that are broken down by the liver. Additionally, children and those who are pregnant or breastfeeding are advised to avoid all forms of Oregon grape, as berberine - the main active component - can cause brain damage in infants and young children. Oregon grape should not be used to treat infections without consulting a doctor. Most of the culinary products made from Oregon grapes use the plant's berries. The most common preparations are jellies and wines.The berries are rarely eaten by themselves because of their tart flavor, but they may be eaten when mixed with other, sweeter berries. The best way of reaping the medicinal benefits of Oregon grapes is using them in medicinal preparations. Infusion. Boiling three teaspoons of chopped Oregon grape root in two cups (500 mL) of water makes a tea that can be used to improve digestion. Up to three cups (750 mL) of this tea can be taken per day. Tincture. Up to three-fourths of a teaspoon of tincture can be taken up to three times per day. It can be used internally to treat digestive issues or applied to the skin to heal eczema or psoriasis. Ointment. Ointment made from Oregon grapes is especially useful for healing symptom of skin conditions caused by inflammation. Capsule. Oregon grape capsules can be taken as an easy way to obtain the herb's digestive benefits without experiencing the herb's taste. Though not impossible, it may be difficult to find Oregon grape outside of its native region in the northwest United States. The wines and jellies may be bought at grocery stores or local markets. The grapes themselves are rarely for sale, but the whole plant may be available in some gardening centers. Supplements made from Oregon grape are available in specialized herbal shops, although they, like foods made from the plant, may be less common outside of the plant's natural habitat. Online retailers usually stock a wide variety of Oregon grape supplements and remedial preparations. Oregon grape cultivation is fairly simple, as the plant does not require excessive care, nor is it difficult to maintain. It is a popular garden choice for its decorative appearance as well as for its ability to attract bees and butterflies, encouraging the pollination of plants throughout the orchard or garden. Oregon grape is generally propagated by seeds, which can either be planted directly in the ground or sown in containers and transplanted. Early spring is the best time to plant Oregon grape, although it may be transplanted from a container through the early summer. The best soil for Oregon grape is moist, rich, well-drained soil that is either sandy, loam, or clay. Ideally, Oregon grapes should be planted in soil with a pH level of 3.5 - 7.0. Oregon grapes cannot tolerate alkaline soil. Oregon grapes may be grown in partial sun to full shade, but plants grown in full shade may not produce as much fruit. The plant requires occasional to moderate watering; it can withstand drought conditions for a period of time, but cannot withstand flood conditions. It is advised to plant Oregon grapes in US hardiness zones 6 to 8. Plant seeds or seedlings six to seven feet (2 m) apart. Oregon grape may be pruned after its flowering period ends if the plant becomes straggly, but pruning is not otherwise required. Fertilizer can be used in the spring to increase the plant's yield. Few pests will attack Oregon grape, and no pests pose a serious threat. Oregon grape plants are slow-growing perennials. The shrub reaches an average of six feet (1.8 m) tall and five feet (1.5 m) wide, and it features long, yellow roots. The plant bears small yellowish-green flowers, and the purple berries generally appear in autumn. Oregon grape is sometimes called 'holly grape' because of its holly-shaped leaves. A member of Berberidaceae, or the barberry family, Oregon grape is one of 700 other species that belong to this family. Its official scientific classification is Mahonia aquifolium, although some older sources may refer to it as Berberis aquifolium. Oregon grape is related to several species of plant that are often mistaken for each other. Cascade barberry (M. nervosa), creeping barberry (M. repens), and California barberry (M. pinnata) are three plants that are often confused with Oregon grape. Cascade barberry in particular is difficult to distinguish from Oregon grape because the two plants are physically very similar; however, M. repens does not grow as tall and has a wider habitat range, growing farther south than Oregon grape. Oregon grape is thought to have been used for thousands of years by Native Americans, for its culinary uses, its medicinal uses, and other practical uses. However, few records about the plant exist until much later, when interest was revived in the 19th and 20th centuries. In 1899, it was declared the state flower of Oregon, and has since become more economically important. Demand for Oregon grape products has increased since the plant goldenseal - which also contains berberine - became endangered due to overharvesting. Oregon grape is mostly produced in Oregon and a few other states in the northwest of the United States. In 2010, it was estimated that in a typical year, unprocessed dried Oregon grape root sales range from 20 - 30 tons, up to the value of $230,000 USD. Dye. Uses of the Oregon grape have also traditionally extended to dye-making, and the Native Americans utilized the yellow bark and wood for this purpose. In fact, Oregon grape cream can stain clothing if care is not taken when applying it. Gardening. In modern times, Oregon grape is generally cultivated for landscaping as a low-maintenance, drought-resistant shrub, and it is also commonly used by florists in flower arrangements. Oregon grape's ability to heal skin conditions, soothe digestion, and kill fungi and bacteria make it a valuable herbal remedy, and its ornamental appearance makes it a great addition to any garden or bouquet.